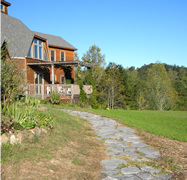 Over the past months, we have been working hard at making the Prama Institute the best retreat and conference center in Western North Carolina. Through volunteer help and donations, we have been able to lay down a new flagstone walk around the building. We have also landscaped and seeded a new lawn area in front of the building, making it an excellent place for camping, playing badminton, holding group meetings, or meditating at dawn or dusk. In addition, we will soon install new windows in the large dome, as the old ones have experienced wear and tear over time. The Prama Institute (PI) is surviving well in a troubled economy by sponsoring inspiring programs of spiritually minded groups and offering more Ananda Marga programs as well. 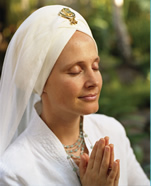 The PI sponsored a Sacred Chant Weekend with Snatam Kaur at the Unitarian Church in Asheville on May 23, followed by a workshop at the PI on the 24. A regional audience was very appreciative of the high level of musicianship of the 5 musicians and angelic voices of Snatam Kaur. The PI in cooperation with Asheville Wordfest featured local poets Keith Flynn, Sebastian Matthews and Laura Hope-Gill at an Evening of Poetry and Rhythm followed by the Crystal Zoo Band, Reunion Concert. On May 28- 31 we hosted a silent Jewish retreat, Awakened Heart. On June 19-26 the Whole Life Retreat, a group from Kentucky returned to the PI for their annual teacher training conference. Other groups that held workshops at the PI in the last 6 months included a Middle Eastern Dance Retreat on September 11-13, Lighten Up Yoga from Asheville holding its annual training from October 18-20, Barefoot Yoga from Lexington Kentucky, Gotta Yoga from Charlotte, NC and Avirgo Mayan Massage from October 12-18. On June 13 the PI sponsored Creating a Sustainable Western North Carolina: Charting a New Path in a Changing Climate, a follow up workshop of the climate change conference that the PI had co-sponsored at Warren Wilson College on March 29. This follow up conference initiated the objective of an alliance for climate change activism among agencies throughout Western North Carolina. From July 20 through August 8 the Ananda Marga Yoga Teacher Training held its 5th annual 200 hour course for certification of yoga teachers. 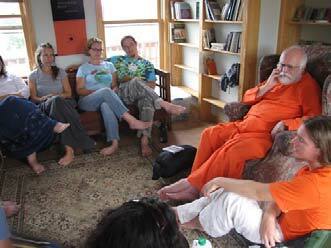 From September 4-7 a Prout seminar was held with classes by Dada Pranakrsananda on the Spiritual Foundation of Prout, Three Fundamental Aspects of Prout Economics by Roar Bjonnes, Howard Nemon and John Gross; an open space workshop on practical applications of Prout that included Prout Lifestyle, Prout and MU’s and Prout and Samaj. A new series of workshops offered by the PI include “Introduction to Yoga Psychology”, “Transforming Stress into Personal and Interpersonal Success”, and “Yoga and Dreams” by Ac. Vishvamitra; “History of Yoga” and “Yoga and Sustainable Lifestyles” by Roar Bjonnes and “Life, Death, and Karma” and “Yoga Cosmology” by Howard Nemon. Construction is proceeding on the 40 acre women’s master unit with the clearing of a lot for the house and offices of the Women’s Wellbeing and Development Foundation. On this acreage they will develop organic farming, an alternative medical clinic, library, gardens and educational/retreat facilities associated with Ananda Marga Gurukula for teaching tantra and intuitional science. The septic tank and septic field have been installed at the location where the house will be built. Electric lines, water lines, and phone lines are now being brought to the house. An electric and a solar pump are being installed in the new well along with two 1200 gallon reservoirs for reserve and drip irrigation of fruit trees and gardens. A 10 x 18 foot pre-fabricated utility shed has been placed on the land for tools and construction materials. 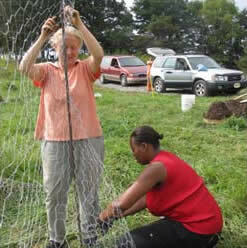 Thirty five fruit trees have been planted and a protective fencing for them put in place.